For anyone new to learning Italian – it’s not easy. I’ve been in Italy since May 2008 and I still haven’t wrapped my head around the Italian prepositions. Plus, I’m a little lazy. Okay, I’m a lot lazy. The first two years in Sardinia I studied and I studied hard with Italian workbooks, Italian learning CD’s, repetition and more repetition. Then it got boring and I studied by watching TV, listening to the radio or having a coffee at the local bar each morning. I should know these off by heart by now, but I don’t. My husband speaks to me in Italian or Gallurese, and depending on my mood I’ll respond first in English, then Italian, and sometimes I’ll throw him for a loop and respond in Gallurese. The look on his face is priceless when I respond to him in his first language and the giggle that escapes from his lips makes me want to do it all over again. 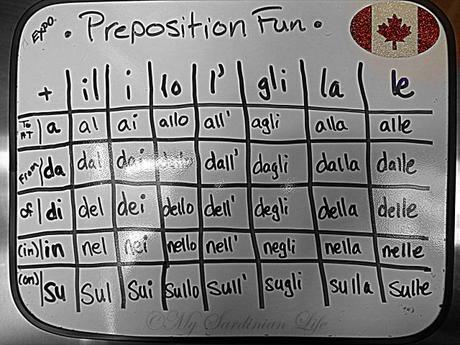 So, in a haphazard attempt to fully memorize the Italian prepositions I wrote them on a white-board magnetized to the fridge. What are your study tips?